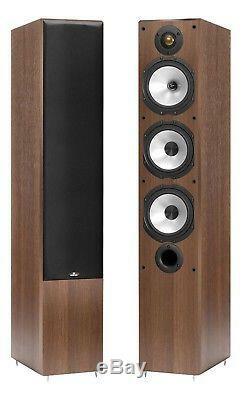 Monitor Audio MR6 Walnut Floorstanding Speakers (Pair). The largest of the Monitor Reference range, the MR6 represent absolutely stunning value for a full-range floorstanding speaker. The large but slim cabinet and array of three metal matrix polymer woofers supply powerful and deep low-end and the clever mid-range, tweeter design and improved crossover mean that treble is kept clean with an extremely clear presentation. Separate chambers inside the speaker cabinet mean the MR6 are able to supply plenty of bass without compromising other frequencies or sacrificing sensitivity. These are very neutral speakers with Monitor Audio's signature levels or clarity supplied by the metal drivers, although they benefit from amplifiers with plenty of head-room, they are not hard to drive and as such offer reasonably flexible partnering with separates and mini-systems alike. The MR6 make a superb choice for hi-fi and contrary to the price, give a sound which is anything but entry level. Combine with speakers from the rest of the MR range for a surround system which is as musically capable as it is able to create an immersive cinema experience. 2 x 6.5" MMP II bass driver 1 x 6.5" MMP II mid-range 1 x 1 gold dome C-CAM Tweeter. External Dimensions incl Plinth (H x W x D). 970 x 200 x 300 mm (38 3/16 x 7 7/8 x 11 13/16 inch). 17.2 Kg (37.8 lbs). 3.5mm Jack - Jack Cables. 3.5mm Jack - Phono Cables. Stereo Phono / RCA Cables. Banana Plugs, Spades and Pins. TV Wall Mounts - Flat. TV Wall Mounts - Tilting. TV Wall Mounts - Cantilever. TV Aerial & Sky Accessories. Find out more about our fantastic demo facility. The item "Monitor Audio MR6 Walnut Floorstanding Speakers (Pair)" is in sale since Tuesday, July 10, 2018. This item is in the category "Sound & Vision\Home Audio & HiFi Separates\Speakers & Subwoofers". The seller is "avopro" and is located in Bacup. This item can be shipped to United Kingdom.